We can handle any sewer drainage problem- from large sanitary systems to small residential isolated blockages. No clog or blockage is too tough for us to clear. BEST utilizes high pressure cleaning heads to flush water through inlet/outlet lines from 1.5" - 30" diameter. We have three different sizes from 1600 Psi flusher for 1.5" to 4" lines, 3000 Psi flusher for 4" to 8" lines and our truck mounted flusher for 4" to 30" lines. BEST offers our clients high resolution video camera inspection that can travel hundreds of meters through sewer lines to provide detailed imagery including blockages, root intrusions, improperly fitted pipe work or collapses. This highly efficient diagnostic tool eliminates the guesswork and reduces repair time. 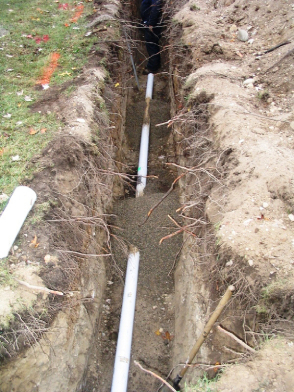 BEST sewer specialists will look after full excavation to repair and/or replace sewer lines. A working sewer line is something that is easily taken for granted, until it stops working - then it can become a nightmare. If your sewer backs up into your home through the toilet or bathtub or leaks into your front lawn, time is of the essence. You can count on BEST for fast diagnosis and repair to any sewer system issue.